One of the central figures in the controversy over Uganda’s Anti-Homosexual Bill is Caleb Brundidge. He was one of the trio of Americans who traveled to Uganda in March of this year to present his views at an ex-gay conference hosted by Stephen Langa’s Family Life Network. One effect of the conference was a group of people who called for stronger legislation against homosexuality. In April, the Anti-Homosexuality Bill was first disclosed to the Ugandan Parliament. While Exodus recently came out strongly in opposition to the bill and Scott Lively has indicated that he does not support the death penalty, Brundidge and his organizations have refused to comment directly about the matter. In the Spring, I sent emails to Brundidge and the International Healing Foundation which went unanswered. I know of no public statements to the press about the Anti-Homosexuality Bill. The only public comment about the Uganda trip was posted in the IHF newsletter and did not mention the bill. Wondering if perhaps his ministry partner, Extreme Prophetic, might want to comment, I contacted Rob Hotchkin who Extreme Prophetic designated as a media spokesperson. I asked him to disclose the position of Extreme Prophetic on the bill and criminalization of homosexuality in general. As a ministry we do not have an official opinion on political policies. I am sure each member of our team has personal beliefs about most national and international political situations, positions, or policies, but as a ministry we do not have an official opinion on political matters. We are a “love” ministry and believe the greatest power in the universe is the love of Jesus, and that it is His love, so brilliantly displayed through the finished work of the cross, that will reach out and touch every man, woman and child in every nation around the world. For God so loved the world, He gave His only begotten Son so that none may perish, and all may have eternal life (John 3:16). As per your question about Caleb Brundidge. He is a member of our evangelism team, and also one of our itinerant ministers. If you are interested in hearing Caleb’s personal views on the reported Ugandan bill, or to hear from him what he shared when he was in Uganda in the Spring of this year, you can reach him directly by e-mailing cbrundidge@xpmedia.com. While Christians are in pursuit of the supernatural, or the glory or prosperity, but they’re missing the apostolic assignment. They are to take over spheres and adminstrate them for the glory of God. They’re to take over spheres and administrate them for the glory of God. That’s the only way you can teach nations is when you take over a sphere and administrate it for the glory of God. Wallnau spends much time talking about how gays have taken over the spheres of influence and how Christians need to take them back and use this leverage to advance the Kingdom. He laments that Christians are more concerned with revival (individual salvation) than reformation (national salvation). It is key that we note how Mwenda inclined much on the religious aspect of the bill and much of his argument was to justify that the task of judging and consequently punishing sin should be left to God. Societies wouldn’t need law and order if all the tasks of countering sins were to be left for God. I believe that we are doing God’s will. I believe this teaching is helping to provide religious rationale for the bill. Those looking for US influences on government officials in Uganda and elsewhere should not overlook the importance of adherence to this doctrine of reclaiming the seven mountains of culture. I will report soon that there are direct connections from this seven mountains teaching and the Uganda spiritual leaders who are supporting and promoting the Anti-Homosexuality Bill. 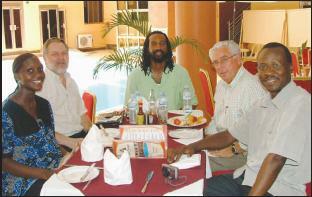 Previous Previous post: Is The Family behind the Anti-Homosexuality Bill?